Oils are used for baking, cooking and for adding flavor to salads. While all oils contain fat, some fats are better for you than others. Coconut oil is high in saturated fat and high levels can increase your risk of heart disease and related factors. 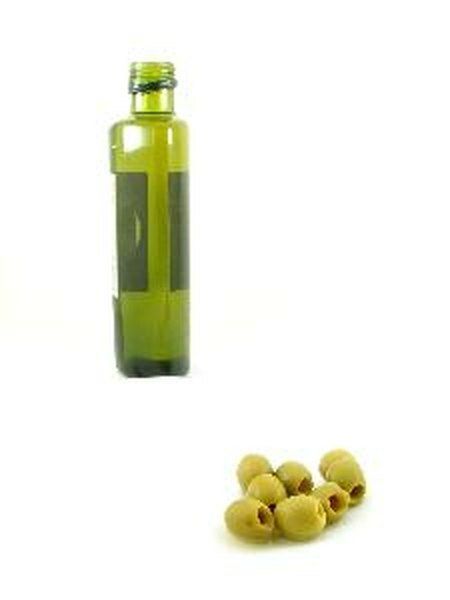 Olive oil is a healthier oil, since it contains heart-healthy monounsaturated fats. For a healthy heart, replace the coconut oil you use with olive oil. You need some fat to maintain your core body temperature, produce certain hormones and to absorb fat soluble vitamins A, D, E and K. The United States Department of Agriculture recommends having 20 to 35 percent of your caloric intake come from fat. Each gram of fat provides 9 calories. Based on a 2,000 calorie diet, you need 44 to 77 g of fat per day. Olive oil is healthier than coconut oil, since it is high in good fats. Monounsaturated fats, or MUFAs, from olive oil, have several key benefits on your body. A monounsaturated fat known as oleic acid, found in olive oil, can help lower blood pressure, reduce your risk of cardiovascular disease and improve negative effects associated with type 2 diabetes, according to the University of Maryland. Virgin olive oil also contains high amounts of polyphenols, which are a type of phytochemical that act like an antioxidant in your body. Antioxidants fight off free radicals, which damage cells and can lead to chronic illnesses like cancer. Tropical oil, like coconut oil, is an unhealthy selection because it contains high levels of saturated fat. Around 92 percent of the total fat found in coconut oil is saturated, explains the American Heart Association. Consuming too much saturated fat can harden your arteries, which raises your blood pressure. Eventually, these conditions can damage your heart, leading to heart disease. Based on a 2,000 calorie diet, you should limit your saturated fat intake to no more than 15 g, or 7 percent of your total calories. A single serving of coconut or olive oil is equivalent to 1 tsp., which contains 5 g of fat and 45 calories, notes the American Dietetic Association. Limit your total consumption of oils to 6 or 7 tsps. per day. Cut calories from your diet by cooking with a 0-calorie pan release spray, instead of oil. In addition, make sure that you measure olive oil before you drizzle it on your salad to avoid consuming too much. Coconut oil can lead to too many health problems if consumed in excessive amounts and should be consumed in moderation or eliminated from your diet entirely.